Time to head back to Idaho to see my doctor, family, and friends. The snow has finally melted from around my trailer and I promised all to return at that time. Hitching up went pretty smoothly. We put brother’s car in storage next door. Off we went. The trailer felt good behind my SUV and I didn’t feel the usual nervousness I get driving the first time after sitting somewhere for awhile. About an hour down the road though, we realized that we had forgotten to put the hose in. We pulled over and made a quick call to the park to ask them to store it for us until we got back. I knew things couldn’t go that smoothly. Since we pulled out late, I knew we had little hope of making it to my first park choice beyond Boise, ID. I had already prepared for that though and had 2 other parks loaded in my GPS that would be suitable and closer to stop for the night. We easily found the Power-POP RV Stop right off the highway in Glenns Ferry, ID. It is very small with only 14 spaces but they are pull-thrus with full utilities and it is a Passport America park. The owner was very nice. He built this park in his backyard which is quite large and next to the fairgrounds which was pretty smart. The only con to the park is it is right next to a rail yard so expect to see and hear trains. I had no problem sleeping there though. The next day we left early en route to Richland, WA. Somewhere along the way, the cover blew off one of my rear lights. We arrived in Richland and put up at my son’s in-laws again in their driveway. No one was home so we just backed it on in, hooked up to the outside electricity, and made ourselves at home. Don’t you just love guests who bring their own guest house? We had a great time as usual at the in-laws. They are always fun to be around. 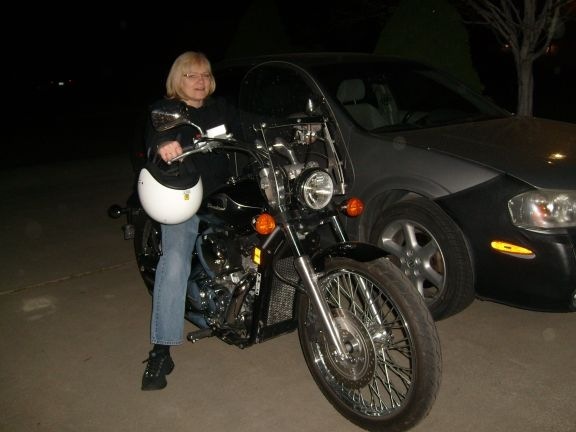 Barb got her motorcycle license while we were there after completing a safety course. One night, they went to go to bed and found the dog had pooped on the bed which had them quite befuddled until they poked it and realized it was rubber dog poop. Katrina was there! Snicker. 😀 We kept leaving it in places for each other all week. Barb really enjoyed seeing it on her potatoes in the sink and in the dishwasher. We had a BBQ again. My son and his wife came over with my grandkids. My son and grandson thought they were going to get me with a water pistol and water balloons they brought over but I was prepared with my own Super Soaker primed and ready for them. The annual Spring water fight was a blast and I got them good! We also got my daughter-in-law screaming when she went to pull out the potato salad and found a cockroach in it – rubber of course. Every time she turned her back on me I slipped rubber cockroaches into her food. We got her again at dinner at her house. To get me back, Jon served me up a rubber dog poop burger at the BBQ. LOL. Before we left, we put Vick’s Vaporub on the knob of the door into the house and the refrigerator door handle then left town fast. We got Jon with both I hear. Believe it or not, they actually invited us back! Also while there, I got some geocaching in on their bike trail and nearby. 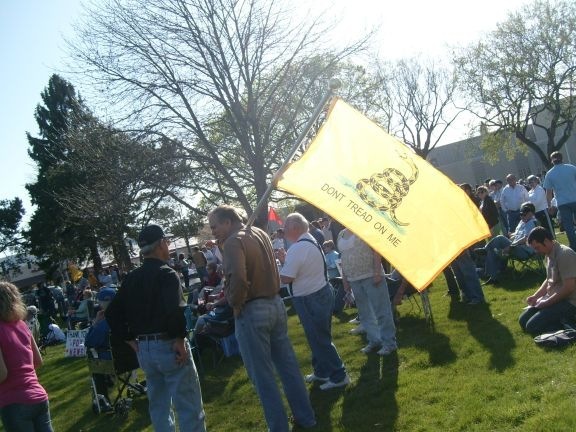 I went to the local Tea Party on April 15th for fun and to hear what they had to say. 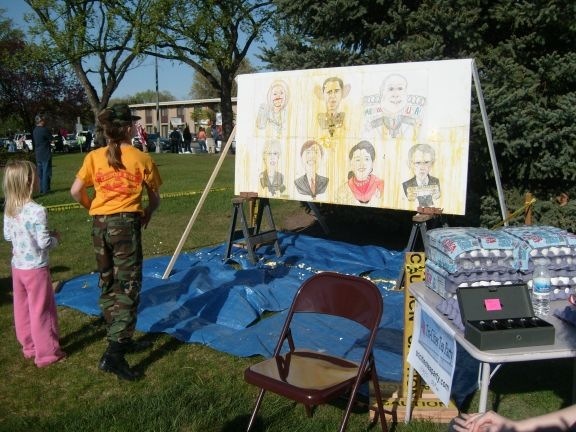 I got to throw eggs at pictures of several politicians. Always wanted to do that. Before we left, we debated whether to go find a dump for the tanks or just go. The nearest campground wanted 10 bucks to dump there. Geez! For that kind of money they should dump it for me! But, with gas as high as it is, pulling a lot of extra weight did not appeal to me. I wasn’t real happy about the lumbering elephant that pulled out behind me either. We found a free RV dump over at the marina and boy did that make a difference in the way my trailer pulled; huge difference and well worth the time spent.